Move over, Chipotle. This Instant Pot Mexican Shredded Beef is to die for. 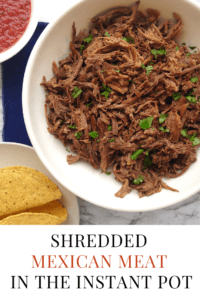 If you like Mexican food, you’re going to love this shredded beef. It couldn’t be any easier to make, but with flavors of salsa verde and garlic, the taste is amazing. You make this recipe in the Instant Pot (or any electric pressure cooker), but I’m also going to share instructions for cooking it in the slow cooker. Let’s make us some meat, shall we? 2. Cover the roast with all of the other ingredients and set to High Pressure for 90 minutes. 4. Remove the meat to a large platter or dish and shred with 2 forks. 5. Spoon some of the liquid onto the meat to moisten and flavor it. Adjust salt to taste. Making this Mexican meat in the slow cooker is super easy, just like the Instant Pot, except you don’t even have to cut the roast into pieces. Here is how to make it in the slow cooker. 1. Put a 3-5 pound beef roast in the slow cooker and cover with all the other ingredients. 2. Cook on low for 8-10 hours. 3. Remove the meat to a large platter or dish and shred with 2 forks. 4. Spoon some of the liquid onto the meat to moisten and flavor it. My favorite way to serve this beef is on a Build-Your-Own Mexican Food Bar. Mexican food bars are an easy way to feed a crowd because each person can customize his or her plate to make whatever their heart desires: taco salad, burritos, burrito bowls, or nachos. It’s a great option when you’re serving guests who have special dietary needs. You can make lots of dishes with leftover Mexican meat. 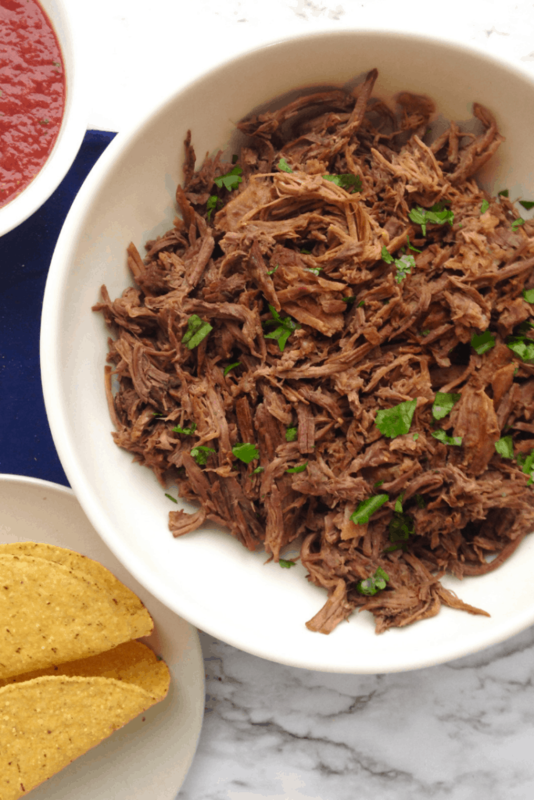 Mexican Shredded Beef is a great main dish for your next fiesta. Let me know in the comments if you try it! Cut the roast into 2-3 chunks and place in the Instant Pot. Rub the roast with garlic, cumin, and salt and pour onions and salsa verde over the top. Pour water in, trying to avoid the top of the roast. Close the Instant Pot and cook on high pressure for 1 1/2 hours. Quick release. Remove the roast from the pot and shred with two forks. Pour 1/2 -- 1 cup of liquid from the pot over the meat for the best flavor. Salt and pepper to taste.